An image of the hazardous conditions in the windowless basement of a laundromat that tenants were living in. SAN FRANCISCO (Aug. 22, 2017) — City Attorney Dennis Herrera today announced he had filed suit against the building owner and a commercial leaseholder who exploited 20 vulnerable residents for years by charging them rent to live in unsafe, dungeon-like quarters in the windowless basement of a laundromat in the city’s Outer Mission neighborhood. The lawsuit filed today in San Francisco Superior Court names the building’s owner, Melissa Mendoza of Hillsborough, and her limited liability company, Lexamark Building, LLC, that owns the building. The lawsuit also names Ernesto Paredes of Daly City, the master tenant for the top floor and basement of the building who rented the basement “units” for $300 to $900 per month. He collected the rent in cash without providing the tenants a receipt or a lease. According to the civil complaint filed in court, Mendoza and Paredes violated myriad fire, building, electrical, plumbing and other municipal codes; failed to address numerous city-issued notices of violation, an order of abatement, and a notice of enforcement; and operate a building that is a public nuisance because of the risks it poses to occupants, first responders and the public. The lawsuit also contends the defendants violated state housing law and engaged in unlawful business practices. This lawsuit follows the city’s rapid response to the dangerous living conditions endured by the defendants’ victims. Late on Christmas Day 2016, the Fire Department was called to the building for a non-fire-related emergency call. When the first responders saw the conditions in this subterranean space, they alerted fire inspectors. On Jan. 5, 2017, fire inspectors cited the building for numerous code violations, including inadequate and blocked egress, the lack of illuminated exit signs, construction without permits, and other unsafe conditions. The building owners refused to abate these life-threatening conditions. After conducting an administrative hearing, on Feb. 14 the Fire Department ordered that the basement level of the property be evacuated within 48 hours to protect human life. Pursuant to state housing law, the Fire Department also ordered the building owner and master tenant to pay relocation compensation of $4,262 per unit to the tenants. Meanwhile, city officials, through a coordinated effort, quickly marshalled public and community resources to find living quarters and support services for the residents. 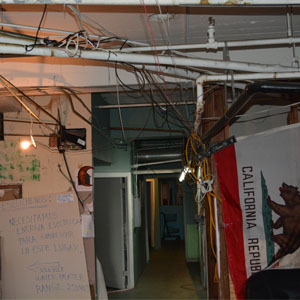 The city’s investigation has revealed that the basement of the three-story building at 4680-4690 Mission Street, which houses the “Clean Wash Center” laundromat on the ground floor, had been a dank labyrinth used for unsafe housing for more than 10 years in defiance of numerous state and local laws protecting public health and safety. People had been living in the basement for at least 11 years. The last legal use was as a subterranean garage. Since at least Jan. 20, 2012, the concrete basement had been configured as a rabbit’s warren of drywall-and-wood partitions that created approximately 20 residential rooms, two kitchens and three bathrooms. All were constructed without the benefit of required city permits and inspections. In January 2017, around 20 people, including at least one 12-year-old girl, were living in the basement, which the defendants named 5 Persia Ave. One was receiving dialysis, and another was a cancer survivor. Most of the tenants were working-age adults, ranging from 30 to 40 years old, but the eldest was 72 years old. The residents included single adults, couples and parents with children. The longest-residing tenants had lived in the basement for 11 years. The living conditions were stark. Only one of the three bathrooms in the basement had a functioning shower, there was no garbage collection for the residents, and the ceiling and pipes leaked. Exposed wiring laced the makeshift walls. At points in the past the space had been infested with vermin, including rats, mice and cockroaches. There were no windows, and the only exit was 200 feet away from the furthest sleeping unit, a serious violation of fire safety requirements. None of the rooms had running water, hot water, or heat. Tenants were forced to heat water on hot plates to have hot water for bathing and other necessities. Once the master tenant even cut off power to the basement, forcing residents to use a portable generator for electricity and creating a threat of fatal carbon monoxide poisoning. Inspectors found code violations on every floor of the building. For example, two boilers were installed and operated without permits on the ground floor, posing a threat of explosion. The top floor was unlawfully converted to a church even though it didn’t have a permit and never underwent inspections to ensure it was safe for group assemblies. Both the basement and the top floor are now unoccupied pending resolution of the code violations. In the lawsuit, brought on behalf of both the city and the People of the State of California, the City Attorney seeks a court order preventing the unoccupied areas of the building from being used until it is brought up to code; restitution for the tenants; civil penalties in nine different categories ranging from $200 to $5,000 per violation, including up to $1,000 per day for each day of fire code violations; and attorneys fees and costs.